Last week, construction began on the Midtown Streetscape project, which includes significant changes to Mount Royal Avenue. Last night, Baltimore City Department of Transportation held a meeting to update the public on the project. We have been long advocating for improvements to this project, beginning with advocacy to include bike lanes, as they were removed early in the project due to opposition from MICA's former president. Revised plans included a segment of two-way protected bike lane that ended prematurely before North Avenue and dangerously at the Mount Royal JFX offramp, where bicyclists were encouraged to transition to sidewalk. 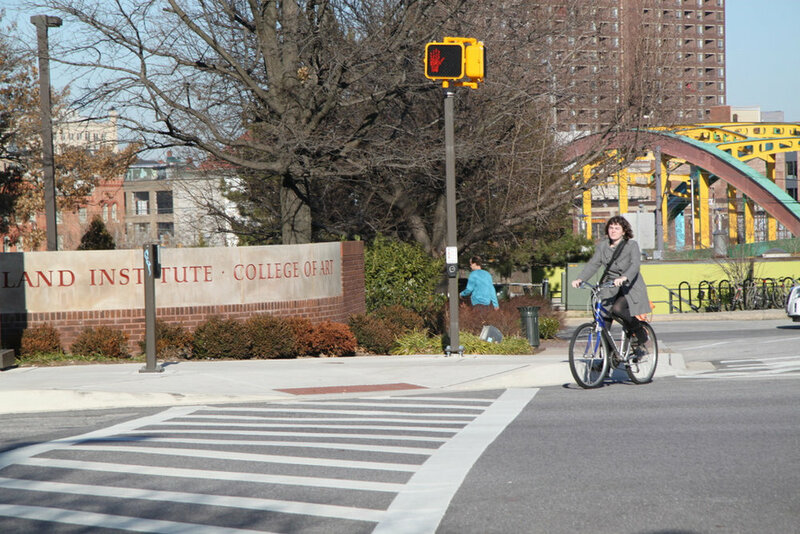 Baltimore City's Bicycle Friendly City status was renewed on a commitment by then DOT Director William Johnson to make design changes to extend the protected facility for the entirety of the Mount Royal Corridor, and make changes to the offramp to improve safety. After years of these discussions, leadership transitions, and project delays, last summer Baltimore City Department of Transportation held a 95% design meeting. No changes discussed in the prior near-decade had been implemented. Our summary of that meeting is here. A road diet, meaning removing one of the car travel lanes in each direction, either a) the entirety of the corridor, b) from Guilford to Maryland, c) from Maryland to North Avenue. This would allow for an on-street protected lane or no loss of parking, and no reduction to medians, saving millions of dollars in concrete work and the need for tree removal. Closure of the I-83 off-ramp at Mount Royal and Saint Paul Streets entirely, and at minimum closure of the Mount Royal slip lane of the offramp. Extension of the bicycle lane to Guilford Avenue and to North Avenue. No report back ever occurred. All stakeholders continuously followed up requesting updates, and those emails and phone calls went unreturned. The project was awarded this past winter, in violation of the agreement, and again emails and phone calls requesting comment were unreturned. Last week, the project broke ground without notification to stakeholders. At last night's meeting, the same project boards were presented, showing no changes to the design. However, the power-point was updated, showing a slightly redesigned bicycle facility, and former DOT Interim Director Frank Murphy acknowledged that a DOT staff meeting had occurred just an hour before the public meeting to discuss implementing the red line changes stakeholders had been advocating for the past five years. We will be working with Councilman Costello's office to participate in a re-convening of stakeholders again to reiterate these requests, and demand that any redline changes that are possible to make at this stage are made. We will likely end up with a project nobody is happy with, but we still must advocate to make it safe and adequate. There are a thousand larger questions surrounding this project: Why we are moving forward with a design nobody likes? Why was over 5 years of direct input ignored? And how we can change our city's transportation planning culture to prevent things like this from ever happening again, by passing robust Complete Streets legislation and empowering our city council members with tools to get real answers from agencies and be able to hold them accountable?